What exactly are Stanchions? They are, simply, the posts or supports for barrier-based crowd control systems. Forming crowds of customers into orderly lines and queues and blocking access to restricted areas can be difficult without the proper crowd control tools. 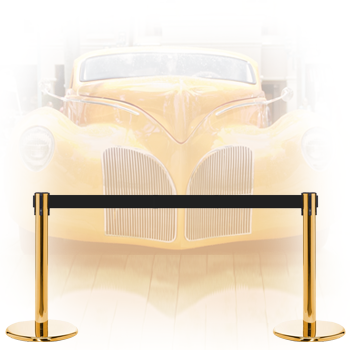 Although tape or belt stanchions are frequently associated with red carpet events and artistic premiers, they also provide businesses across all industries with everyday functionality as well as style. Whether you operate a small restaurant or a sprawling theater multiplex, a bank, gallery, club or church, post and rope systems will help customers find their way. Any building with a dining hall can benefit from this type of stand. Traditional stanchion-based post-and-barrier systems, also called crowd control barriers, are available in many styles, including retractable belt systems and velvet ropes with clip-on hooks. Other choices include plain or custom-printed café barriers that combine branded marketing with crowd control. 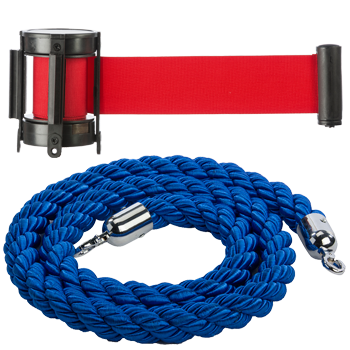 StanchionsDirect.com offers a visual gallery showing our exceptional assortment of colors, styles and options for belts, posts, ropes, connecting hardware and stanchion accessories for sale. What types of crowd control barriers do we offer? Traditional stanchions are the base of standard post and rope stanchion systems. The free-standing poles allow a barrier material such as rope or chain to be easily attached. Retractable belt barriers use plain or custom-color nylon belts to delineate space in commercial environments. In addition to freestanding posts, wall mount adapters are available that allow more permanent installation. Café barrier systems combine sturdy freestanding pole bases with durable polyester fabric panels that offer customers protection from wind as well as increased privacy. This type of panel can be easily custom-printed to provide advertising and marketing messaging. 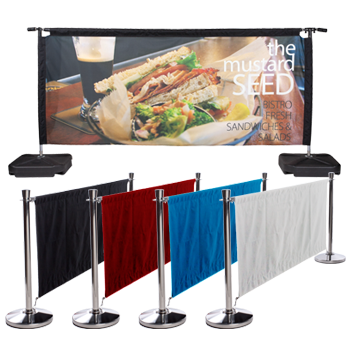 Crowd control system accessories include everything from multiple velour rope colors to printed retractable belts to pole-top signage to custom-imprinted café barrier systems in full color. Why search for a used stanchion for sale when we have a huge selection of affordable crowd control posts. Our QueuePole Economy series consists of durable steel fixtures which have been designed to serve both style and function. The stanchions in this series come with either a sleek retractable belt or an elegant hanging rope, both of these diverse lines have solutions for high end and the casual customers alike. What separates one retractable belt barrier system from another? 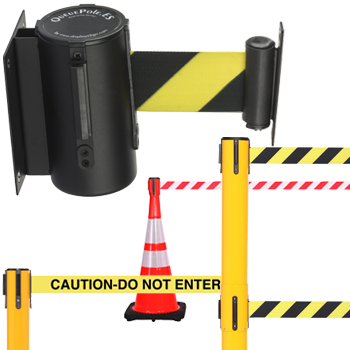 Deluxe crowd barrier systems, like our Deluxe QueuePole line or branded Tensabarrier 13-Foot Belt Sets, allow customers to quickly, and perfectly, match new or updated accessories to existing systems. Deluxe quality crowd control systems are generally manufactured using heavy duty materials and offer a wider variety of styles and accessory options than other models. Economy stanchion models, such as our "QueuePole Economy" line, offer the same functionality as deluxe systems but at a lower cost. Significant savings can be accomplished through offering different finishes, fewer color choices, a smaller number of accessories or using lighter-grade materials. Economy models, however, are still commercial-grade crowd-control fixtures designed for heavy use in business or professional environments. In addition to our huge selection of stock models, our live inventory is home to customizable café barriers, portable poles with built-in wheels, and accessories for deploying the poles. Deciding on the right model should take information such as volume, frequency of use, traffic, and aesthetics into account. While some customers are in search of bulk quantities designed to outfit festivals, others are in the market for a simple line formation tool for dining areas or restaurant. No matter which style you ultimately choose, you can be sure that you are getting great value and fast shipping from StanchionsDirect.